Marquez with an emphatic win! Controversies solved. No judges’ scores decided the outcome this time around. I’m a Pacquiao fan, but there’s no way he won the fight. You do not have to be a boxing expert to determine the true winner. MARQUEZ GOT ROBBED!!! Pacquiao threw 578 punches, landing 176 for a 30 percent accuracy clip. Marquez unleashed 436, connecting on 138 (32 percent). Marquez’s misses came mostly in the late stretches on the fight, after Roach had implored Pacquiao to step it up. Pacquiao threw 304 jabs—several times during the match he tried to throw off Marquez’s counterpunch timing with double jabs—and managed to land 59 (19 percent). Marquez made 38 out of 182 for a 21 percent rate. Even with Marquez’s right hooks landing cleanly, it was Pacquiao who made more power shots, rocking his Mexican foe with 117 hits out of 274 attempts. Marquez swung 254 power punches and made 100. On the average, Pacquiao landed 14 out of 49 punches per round while Marquez hit 11 of 36. 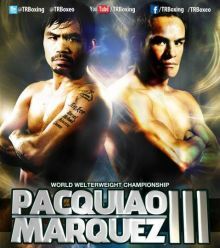 Pacquiao comes in at 143 lbs while Marquez weighed in at 142 lbs. Can’t wait to see Marquez turn into a tortilla.